Every birthday is a unique milestone that deserves special attention! Wording for an 80th birthday party invitation should reflect the special event as well as the personality of the birthday man or woman. Specialized 80th birthday party invitation wording draws attention to the significant age milestone being marketed and honors the person of honor's long life. Some wording phrases can be used with any numeric age, while others are useful more explicitly with an 80th birthday. Turning 80 is really great! Please join us as we celebrate Nicole's 80th birthday. Come party with David, in honor of his 80th year. 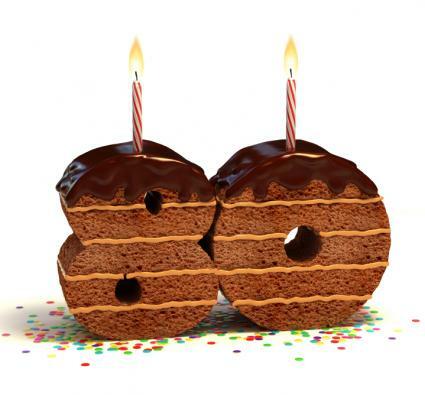 Say it ain't so… Carolyn's going to be the big 8-0! Like fine wine, he's aged so fine, so let's join in a party time! Whatever invitation wording is chosen, it is important that it match the tone of the event and convey the excitement of the special day. The party invitations should also include any special requests or instructions, as well as directions or a map to the party location. 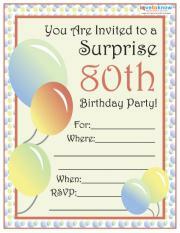 Download these free 80th birthday invitation templates to customize for your celebration. If you need help downloading the printable invitations, check out these helpful tips. 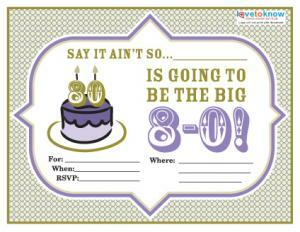 While an 80th birthday is a big milestone, the party invitations can be pretty without being complicated. Keep the invitations streamlined and easy to read, with all of the details well laid out for guests of all ages.